When I was young, my parents celebrated the holidays very simply on the humble budget of our single-income family. We lived in a small, simple town and didn’t have a lot of extras, but there was never anything I needed that I didn’t have. My dad kept a fire burning in the wood stove to heat our home, and the love between us–my two brothers, my parents, and myself–was enough. I remember tromping around the forest in deep snow to find the perfect Christmas tree with my dad. My mom strung multicolored lights around the tree once dad got it into the living room. Together, we decorated the tree with handmade ornaments, reflective of our raggamuffin, love-filled, young family. At the time, I didn’t know the difference between a simple Christmas and anything else. Now that I’m grown, and I live in the city with my husband and six kids, I experience the holiday season in a whole different way. I previously knew nothing about holiday stress or the amount of work that goes into planning, preparing, and executing holiday fun for a large family, but now I know. I know the struggle it is to keep a reasonable calendar and a not-too-crushing task list in December. I know this season–meant to be fun and full of meaning–can easily become a drag if I’m low on sleep, late on planning, and slow on wrapping up the gifts I’m hoping to give. I know all too well how stress can steal the joy I care so much to cultivate during the weeks leading up to Thanksgiving and Christmas, and this is not what I want for myself or my family. 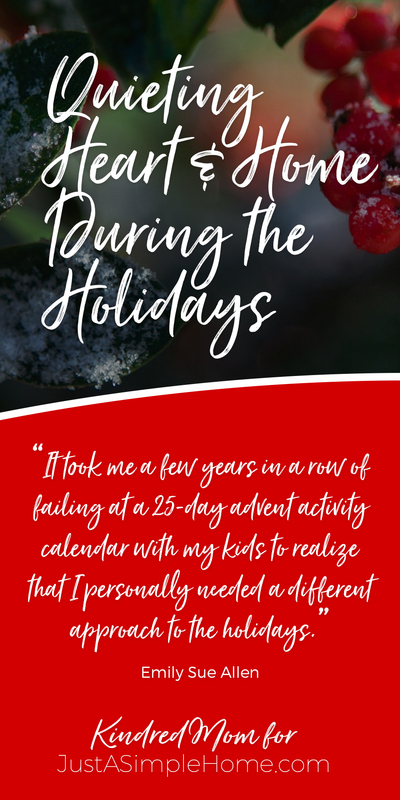 We have had a few seasons marked by overstuffed schedules, more travel than was prudent for our young kids, way too many presents, and it took me a few years in a row of failing at a 25-day advent activity calendar with my kids to realize that I personally needed a different approach to the holidays. Out with the chaos, in with the calm. Now, as I decide what our family needs, I consider what will lead us to joy, peace, connection and meaning, and I do my best to intentionally cut out anything that doesn’t lead us there. I love that Thanksgiving comes before Christmas for the simple reason that reflecting on what I’m grateful for in November for helps me quiet my heart from the busy year behind me. It prepares me for a pace in December that is much more gentle than I might otherwise establish. Quieting the heart, for me, is about pausing my internal battle with worry and quieting the noise of our fall activities to focus in on what is lovely and good. Last fall, a friend of mine posted a photo on Instagram of a white pumpkin she and her family had filled with words throughout the month (each family member with his or her own color pen) capturing what each of them were grateful for. I loved her approach of involving kids in the process of practicing gratitude in such a thoughtful way, and all year, I have been thinking about how I might also draw my kids into quieting their hearts along with me. Quieting the heart is about recognizing, in advance, that the most important things during the holiday season are not the decorations I will put up, the spread of food I will prepare, or the gifts I will wrap. For the kids, I want them to know that Thanksgiving isn’t about how much food they can stuff down, and that Christmas isn’t about how many presents they get to open. I want all of us to remember that the most important thing is to connect with the people we love, and to enjoy each other. That said, one of the ways to make space for that connection after first quieting my heart is to then quiet my home. I look around at the evidence of life within our walls, and I know that we simply do not have room for what will be entering our home in the coming weeks. I plan to declutter one room at a time to make space for the fun coming in, and will start with the spaces that need the most attention. I also keep a close eye on what I fill our calendar with, keeping space for rest and spontaneous fun rather than filling every night in December with another commitment. Lastly, I resist the urge to let the loudest voice be the one that says, “This is not enough. You are not enough.” The truth is, our presence and peacefulness are two of the greatest things we can give our children during the holiday season. Just like my childhood family holidays, I will strive to remember that I do not have to overcomplicate things. Simple is beautiful. Quiet is good. Both are especially meaningful when I’ve chosen them on purpose to create a home during the holidays that cultivates peace, joy, and connection. 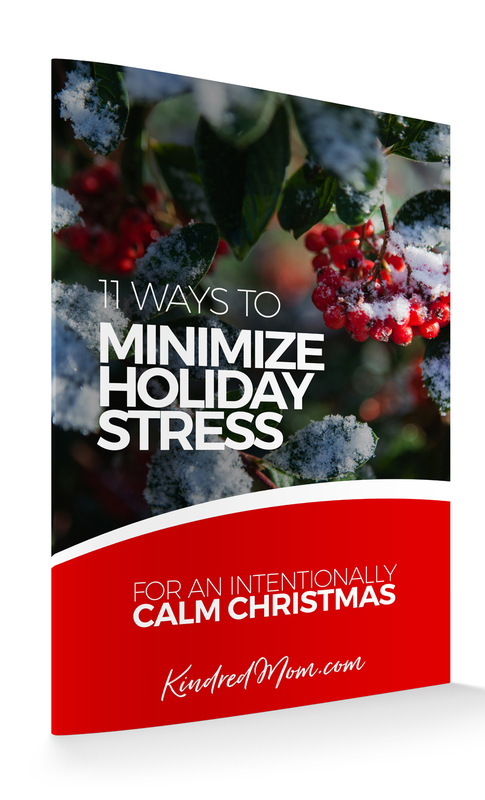 If you long for a peaceful experience through the busy holidays ahead, Emily has created a short guide with 11 Ways to Minimize Holiday Stress with thoughtful, practical tips for navigating the weeks ahead. 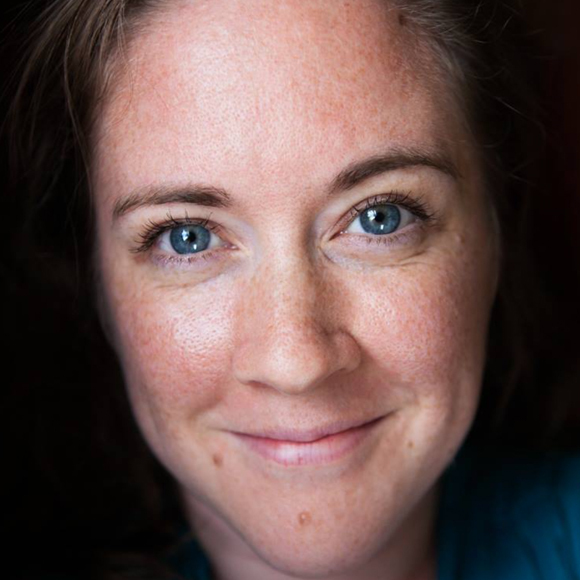 Emily Sue Allen is the founder of the Kindred Mom blog and podcast and is passionate about helping moms flourish in motherhood. She is a contemplative, creative soul who celebrates the beauty of a humble, handmade life and deeply values the power of encouragement. She lives with her husband and six kids in the Pacific Northwest, and personally blogs at lightandloveliness.com. She invites you to connect with the Kindred Mom community on Instagram or Facebook. If you’re looking for ways to flourish in motherhood, get the guide Manage the Mayhem of Motherhood: 52 Ideas to Help You Flourish. Emily this was a terrific article on really preparing for the season the right way. I’m encouraged to be even more intentional with Thanksgiving. “Presence and Peacefulness;” Emily you model that well. Beautifully said. Thank you so much for this! As I have been leaning in to God this season, these are exactly the things He has been leading me to do. Being affirmed in that is priceless for me and many other women I hope!